This weeks featured Mac setup is… well it’s not a Mac at all actually, it’s an iPad-only setup! 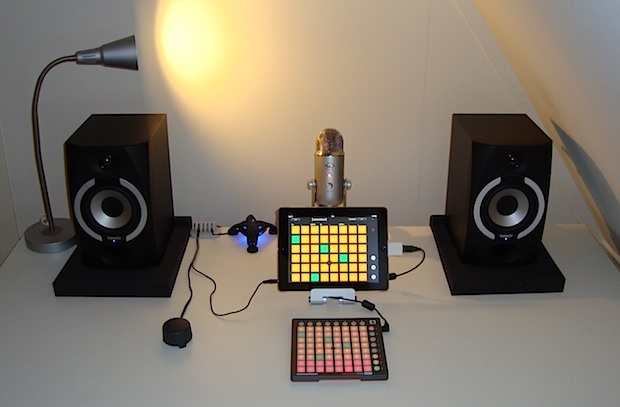 That’s right, coming to us from Jurgen V. is a minimalist music studio based entirely around an iPad. 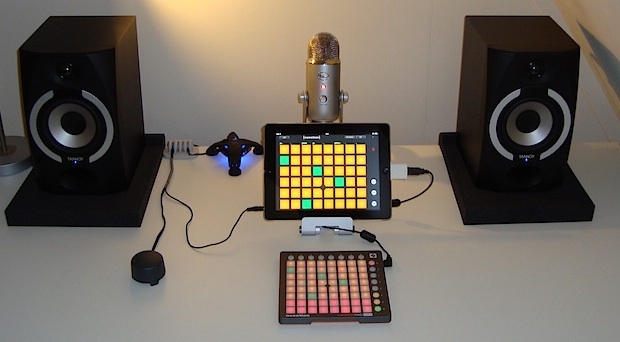 Read on to learn what added hardware and specific iOS apps allow for an iPad to become a music producing workstation. My iPad setup is used for dance music production. I bought my iPad 2 and have been exploring its limits for a while now. Having been into dance music all my life I wanted to build something different based on the iPad, which is an incredible device! I create dance music, so midi controllers and really good apps are essential and work great together. Thanks to the portability of the iPad, and the variety of pro-sounds and pro-apps, you can create and re-create anywhere, then hook it up to the monitor set-up and master the audio. My work is all based on creativity. I am not a person who sits around waiting for the best ideas to come to me, I’d rather be out in the world to record samples and take inspiration from all around me – the iPad allows this. The monitors (speakers) are powered and have a really clean sound with plenty of depth, this combined with the volume control gives you all the power you need for a compact set-up like this. Although the iPad works great as is, for a little more control you really do need a separate midi controller, and that’s where I use the Launchpad Mini. It’s very compact but still a great tool, and it is compatible with almost every app I use. The microphone is for sampling everything else, the quality is great for my type of music. What are some of the iPad apps you use most often? Cubasis is what I use as my DAW (Digital Audio Workstation), combined with AudioBus and Audio Copy, you can get all the sounds from all your different apps directly into your DAW, so there is no need for extra instruments. Just play > record > export > import > create, all on the iPad. I use Audio Master for the final mixdown. Do you have any tips for someone looking for a similar studio setup? 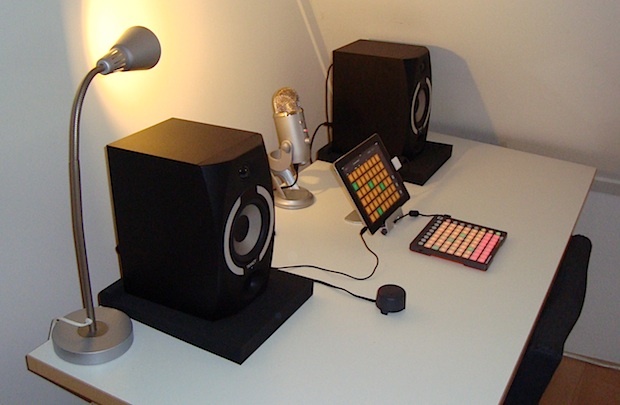 If you want to build a basic studio like this do not go cheap, buy some good quality products, hardware, and apps that suit your music style. If you are not sure, just talk to an expert and ask all the questions you need answered. The key here is think before you buy! Do you have a sweet Apple setup you want to share? Whether it’s a Mac, iPad, iPhone, Apple TV, or all of the above, answer these questions about your hardware, usage, and send in a few high quality pictures and it may be featured on OSXDaily! I really love all the Mac setup posts but I am really impressed by this, it’s great to see someone able to use an iPad exclusively. I couldn’t do it (I am too keyboard heavy for work and otherwise) but I think this is very clearly a movement of the future. Genuinely unique and impressive. Now I wonder how many more creatives are using iPad only setups? For office tasks on the ipad I have a BT keyboard and a wifi-drive, do not have to disconnect anything. Music I can create anywhere an master later. Works really well but takes some commitment to let go what you are used to. Love it. Question, I see you have an adapter on the 30 pin dock of the iPad 2. Is that then being used for input from the midi controller? I assume the audio out to XLR goes to your pre-amp by the looks of it. What adapters and how you have it all tied together would insightful. Thanks for sharing! The midi controller connects to the powered usb hub an the hub connects to the 30 pin adapter. The tannoy 501a are powered studio monitors they are connected with a XLR-Y cable to stereo mini jack. The mini jack is connected to the central levelcontrol. Hope this is clear there are no hidden amps or anything else.